short girl, long island. : Sunday Social, Volume Five. This week's Sunday Social linkup is not the usual questions - this week, we were encouraged to post anything that relates to fall. Mine is a list of random things that I associate with autumn. Jimmy Eat World - Futures. This reminds me of attending Stony Brook University, driving around the campus, surrounded by trees with changing leaves. I remember getting this album a few weeks early, from a boy I had a major crush on. He had connections within the music industry + snagged me a copy a month before it was released. I listened to it every day. Halloween. This is the holiday of the season. The entire month of October is basically dedicated to the arrival of this magical day. I love watching children + adults prepare for the holiday. Also, how cute are those tiny tots dressed up on Halloween, walking around in search of sweet treats? SerendipiTea's Chaucer's Cup. Hot tea in a giant mug is such an inviting part of autumn. Chaucer's Cup is so warm + inviting. It reminds me of home. Total comfort tea that I can't live without. 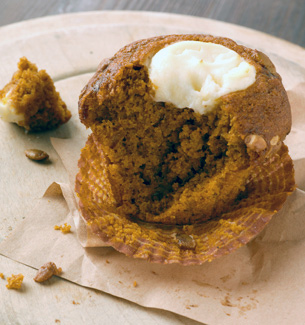 Starbucks Pumpkin Cream Cheese Muffins. I love any food that is pumpkin flavored. These totally unhealthy [but ridiculously delicious] muffins were breakfast on more than one occasion when I worked for the corporate coffee company. When these aren't in season, I would take pumpkin bread + put a thin layer of cream cheese on top. Sounds odd, but it tastes amazing. It's The Great Pumpkin, Charlie Brown. Charlie Brown holiday films are classics. Erich + I were just saying last week that we need to watch this soon. Another warm + fuzzy for the list! Cold weather. Yes, as soon as the temperature drops, the air starts to smell different. I can't explain it, but the crispness in the air is so inviting to the senses. Its even better when you can smell the neighbor's fireplace from your bedroom window. Total heaven. Thanksgiving. I love Thanksgiving for two reasons. First reason - its a holiday about giving thanks, not gifts. It can be a hectic holiday, but nothing like those in December. Its more of a crazy in the kitchen kinda day. Second reason - Thanksgiving dinner. Hands down, one of the best meals on earth. I can eat leftovers three times a day for the remainder of the week + be totally content. What are some things that remind you of fall? You hit all the fall experiences. Love the air, love Halloween. Are you dressing up this year? I'm with you on the fall air! It's gotten cooler here too and all the windows are open! Nice! Its so fun to experience the seasons - we didn't get to do much of that growing up in Florida! My favorite fall accessory is for the home: pumpkin scented candles! Nothing gets me in the mood more! I adore Thanksgiving for the same reason - for giving thanks not gifts!